Sinful Sweets | Healthy Product Reviews!! Unfortunately, the standard “fluff” in the supermarket (as tempting as it looks), is nothing more than corn syrup and refined sugar. Luckily, that’s where Suzanne’s Specialties comes in. They make vegan, all natural and organic sweeteners and toppings. 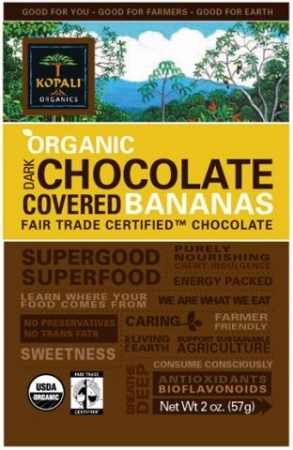 They do not include refined sugars, cholesterol, fat, GMO’s, animal products, preservatives and are gluten free. 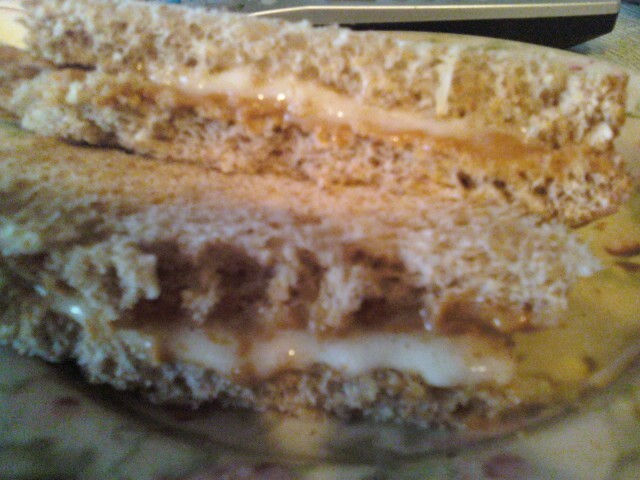 I certainly wanted a pb&fluff sammie once I recieved Suzanne’s Ricemellow Creme. And look at my result..
1.Newman’s Own Cinnamon Sugar Soy Chips, use it as a dip. 2 tablespoons is 40 calories, 0 grams of fat, 9 grams of carbohydrates, 0 fiber, and 0 grams of protein. Brown Rice Syrup, Soy Protein, Natural Gums & Natural Flavors. 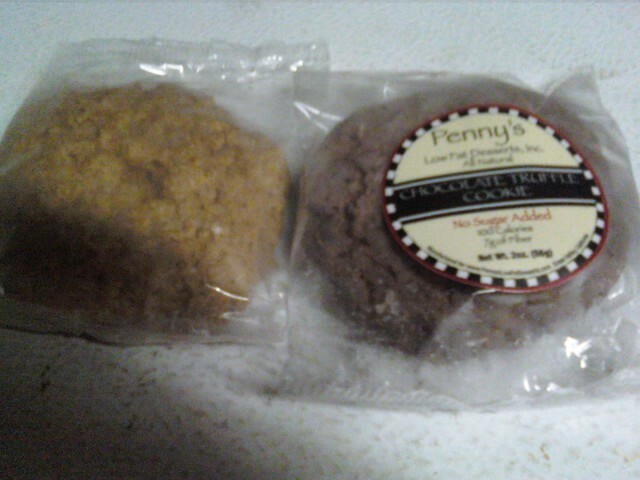 Well, we all know I looooooove Penny’s Low Fat Desserts. She makes some kickin’ products that taste great, are all natural, and have a reasonable portion size for relatively low amount of calories and fat. I reviewed her muffin tops (which ROCKED) here, so if you are unfamiliar with her products, check it out. Recently I received the No Sugar Added Toffee Cinnamon Cookie in the mail. It’s Penny’s new product, targeted especially for Diabetics (coincidence- I AM a type 1 Diabetic! 😉 ). I also tried the other variety Penny offers, the Chocolate Truffle. These cookies are sweetened with erythritol and rebiana rather than sugar, are high in fiber and are only 100 calories each. No Sugar? you ask. Aren’t these going to be bland and have that weird aftertaste? Chocolate Truffle– This cookie fooled my taste buds into thinking it was eating a truffle. It is sooo moist and crumbly, almost a buttery texture. It was sweet, with a deep chocolately taste. The outside rim is slightly lighter in color than the rest of the cookie, and is the sweetest and softest part of the cookie. It’s so hard to believe there isn’t any sugar in this- it’s AMAZING. It was satisfying and filling too, with the 7 grams of fiber. Toffe Cinnamon Cookie- ahhhhh. Also heavenly. It has a delicate flavor, crumbly, soft and melts in your mouth. It was also sweeter on the edges of the cookie than in the middle. It reminded me of the top of those cinnamon crumb cakes. It paired very well with some vanilla yogurt too. Chocolate Truffle Cookie- 1 cookie is 100 calories, 3 grams of fat, 32 carbohydrates, 7 grams of fiber,and 3 grams of protein. Toffee Cinnamon Cookie-1 cookie is 100 calories, 2.5 grams of fat, 33 grams of carbohydrates, 6 grams of fiber, and 3 grams of protein. Chocolate Truffle Cookie-erythritol, water, oats, dried plums, whole wheat flour, pasteurized egg, cellulose, chocolate liquor, alkalized cocoa, natural flavors, rice syrup solids, chicory root extract, xanthan gum, guar gum, sodium alginate, gum acacia, food starch, ammonium calcium alginate, baking soda, palm oil, salt, cinnamon, soy lecithin, rebiana. Toffee Cinnamon Cookie- erythritol, oats, water, dried plums, whole wheat flour, pasteurized egg, cellulose, chocolate, natural flavors, rice syrup solids, chicory root extract, xanthan gum, guar gum, sodium alginate, gum acacia, food starch, ammonium calcium alginate, baking soda, palm oil, salt, cinnamon, soy lecithin, rebiana. Hey, you! Don’t forget to enter the DONUT and 150$ giveaway by Holey Donuts! Just visit the website and put MY blog name and website in the subject line, and fill out the contact info. Then leave me a comment. More info provided HERE. Jenny from PB&J is also hosting a giveaway.! Holey Donuts! 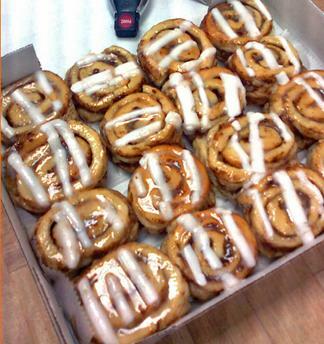 Cinnamon Bun Middles plus… BEST GIVEAWAY EVER! I know what your thinking- donuts can’t be healthy. But Holey Donuts! definitely has a healthy twist on donut making. All their products are low in fat due to a special baking technique that doesn’t require deep frying the donuts. As a result, these products are lower in fat and calories as compared to Krispy Kreme, Dunkin Donuts and Entenmann’s products. They don’t use artificial sweetners and there are no trans fats in these products. Yet they claim to taste just like the real thing- sans the artery clogging fat. Upon opening the box, there were about 20 of these babies, all about the size of my fist, and they looked GOOD. Just like those pillsbury ones you bake in the oven and drizzle with icing. I was so excited to try one- I bite into one right away. *oops* they were frozen! Heh, silly me 😉 But anywho- I took the partially bit cinnamon bun middle and stuck it in the microwave for 10-15 seconds. The result? The bun was warm, with gooey icing dripping down the sides and a sweet and cinnamony aroma filled my kitchen.My mouth was watering at this point. GONE are the days I thought I could never have cinnamon buns again. Holey Donuts! has a cinnamon bun fairy that has created this magical dessert for little caloric damage (only 80-100 calories EACH!). The dough was soft and chewy, covered with cinnamon and a gooey, sweet vanilla icing. It wasn’t greasy at all, and had a lighter feel to the dough. The real center or core of the cinnamon bun had tons of cinnamon, and i think i even tasted an apple piece. It was denser than the rest of the cinnamon bun, and absolutely delicious. Seriously guys. This thing tasted SINFUL. It brought me back to my pre-health conscious days where i would engulf a Dunkin Donuts cinnamon roll (my favorite!) at 340 calories and 20 grams of fat eat. It’s nice to know i have a nice swap. You can buy some of these guys here. or, WIN THESE DELICIOUS TREATS AND MORE! make sure you e-mail them AND leave a comment on my blog! For every person YOU refer that e-mails Holey Donuts! in my name AND leaves a comment on my blog, you will have a chance to win a SPECIAL PRIZE provided by me! You can do this by twitter, adding it to your blog entry, google reader, ANYTHING. Whoever refers the most people will win the prize!! Make sure the person leaves a comment on MY blog also saying that they were referred from you-unless you do not get any credit!! So what are you waiting for? ENTER & REFER TO YOUR FRIENDS!! 1 cinnamon bun middles is 80-100 calories, 1.5 grams of fat, 20 carbohydrates, 1 gram of fiber, and 2 grams of protein. It also contains 9 grams of sugar. Donut Base-Enriched Flour (wheat Flour, niacin, iron, thiamin mononitrate, riboflavin, folic acid), dextrose, soybean oil, salt, leavening (sodium acid pyrophosphate, baking soda), mono and diglycerides (TBHQ,citric acid added as preservatives), sodium stearoyl lactylate (dough conditioner), vegetable color (annatto, turmeric).Yeast, purified water. Donut Glaze: Sugar, water, corn starch, corn syrup, food starch-modified, wheat starch, agar, guar gum, potassium sorbate (as preservative), citric acid,silicon dioxide, artificial flavor, dextrose.